Atria/Emily Bestler Books, 9781501125041, 352pp. “The Hatching is a hair-raising thriller that reads like the lovechild of Independence Day and World War Z, but is creepier than both....Every once in a while something comes along that everyone will be talking about. This will be one of those books!" "What Peter Benchley did for sharks, James Herbert did for rats and Michael Crichton did for dinosaurs, Ezekiel Boone does for those eight-legged freaks that lurk in dark corners of our houses. The Hatching is a full-throttle pulse-pounder that will keep you up all night feverishly flipping its pages--and make you check for webs spun under your bed before you reluctantly turn off the lights." "The Hatching is old school global plague horror of the freakiest sort. A deft and nasty thriller." 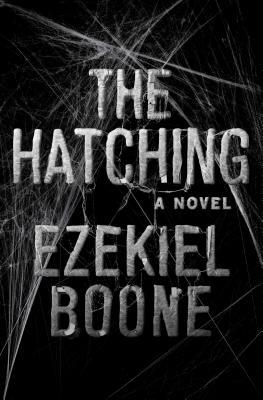 "The Hatching takes an impressively terrible doomsday scenario and adds spiders, making it one of the creepiest books of all time." "Was this book scary? F**k yes! I'm still cringing just thinking about it. [It] didn't help that two days before I read this book, a big f*****g black spider decided he wanted to make a home in my sky box and I still haven't found him! So yes, this book is very scary and will totally give you a fast pace of a scary crawly ride." "World on the brink of madness? Sure. Ancient evil awakening in the form of terrifying spiders? Even better. This novel does a great job balancing the exciting thriller aspects with the skin-crawling horror." "The freakish nature of the fear factor and carnage within the story makes this novel a wonderful addition to the horror-monster genre." "Within my little corner of horrors, I have a small club of authors who are my A-listers. They're the upper echelon of "must read everything they write as soon as I can get my hands on it" talent I've placed above all others. Stephen King, Dean Koontz and Justin Cronin make up the entire membership list. Despite reading a wide range of authors--both self- and traditionally published--I haven't really come across anyone who's been able to make a serious run at joining my top tier. Until now."